Looking for Professional Contractor to Remodel or Renovate a Bathroom? When talking about professional home bathroom renovations, you can choose from a wide range of options. We can help you design exceptional bathrooms at affordable prices. If you’re looking to renovate your bathroom, seeking professional help will be your best choice. We’re are able to provide many different ideas and tips for renovations. Moreover, you’re also able to consult designers and ask about latest trends in bathroom remodeling and renovations. When you consult us for details, you can focus on innovative and flawless designs. This allows you to enhance the utility and visual appeal of your bathroom. When you talk to our professional designers, they are able to suggest something as per your specific needs and requirements. Whether you’re looking for high quality furniture or fixtures, professional help is required to ensure the success of your remodeling project. We have years of experience in the industry. Thus, we can provide you with latest and innovative design ideas. Some of this information is even available on our website. This can give you a lot of ideas regarding your own bathroom remodeling and renovations. Designs change often, and you need to stay updated. Consulting professionals is the best way to achieve this task. 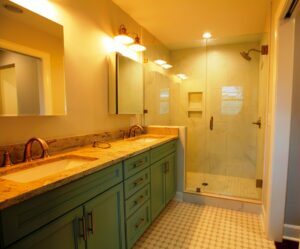 We are the leading bathroom remodelers in Charleston SC and have many years of experience in providing the best possible service to you and your family. We showcase a lot of different bathroom styles, models, materials, colors and designs. This can give you an idea about the designs that match your existing home decor. With a lot of options to choose from, it becomes easier to plan the remodeling or renovation project. You don’t have to rely on guesswork or just compromise on something. You can choose something that complements your existing design. We allow you to compare different products, designs, materials and so on. Sometimes, designs available on our website look similar to each other. However, every design is different in its own way. Designers in our company provide you with details about various designs and products to help you compare different choices. This way, you can make an informed choice. When you’re looking to remodel or renovate your bathroom, we will be your best choice for a bathroom remodeler. You will be able to talk to consultants, designers and get a first-hand look at numerous designs and products, including furniture, showers and other fixtures or accessories. This will help you make a better choice and choose the right kind of colors, materials and designs. Consulting us will help you make your bathroom more functional and practical. In addition to remodeling bathrooms, the expert builders at B. Chaney Improvements in Charleston, SC build custom homes; major additions to existing homes; and outdoor living spaces and porches. They are also skilled at whole-house renovations. As far as home improvements, they install replacement windows and remodel kitchens. They also take care of home repairs.